Strong acids dissociate completely in water, so the reaction goes to completion and they never reach equilibrium with their conjugate bases. Because there is no equilibrium, there is no equilibrium constant, so there is no dissociation constant for strong acids or bases. Because the dissociation of a strong acid goes to completion, there is no tendency for the reverse reaction to occur, which means that the conjugate base of a strong acid must be extremely weak. It’s much easier to find the pH of a strong acid solution than it is to find the pH of a weak acid solution. That’s because strong acids dissociate completely, so the final concentration of H+ ions will be the same as the initial concentration of the strong acid. Let’s look at a 0.010-molar solution of HCl. So you can always find the pH of a strong acid solution directly from its concentration. Kw=1 × 10−14 at 25°C. The common ion effect tells us that the hydrogen ion and hydroxide ion concentrations for any acid or base solution must be consistent with the equilibrium for the ionization of water. That is, no matter where the H+ and OH− ions came from, when you multiply [H+] and [OH−], you must get 1 × 10−14. 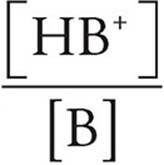 So for any aqueous solution, if you know the value of [H+], you can find out the value of [OH−] and vice versa. The acid and base dissociation constants for conjugates must also be consistent with the equilibrium for the ionization of water. So if you know Ka for a weak acid, you can find Kb for its conjugate base and vice versa. When an acid and a base mix, the acid will donate protons to the base in what is called a neutralization reaction. There are four different mechanisms for this, depending on the strengths of the acids and bases. When a strong acid mixes with a strong base, both substances are dissociated completely. The only important ions in this type of reaction are the hydrogen and hydroxide ions (Even though not all bases have hydroxides, all strong bases do!). 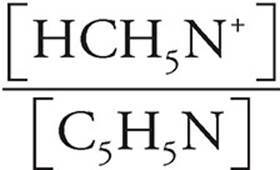 The net ionic equation for all strong acid/strong base reactions is identical—it is always the creation of water. The other ions involved in the reaction (in the example above, Cl− and Na+) act as spectator ions and do not take part in the reaction. In this reaction, the strong acid (which dissociates completely), will donate a proton to the weak base. The product will be the conjugate acid of the weak base. In this reaction, the strong base will accept protons from the weak acid. The products are the conjugate base of the weak acid and water. This is a simple proton transfer reaction, in which the acid gives protons to the base. During neutralization reactions, the final pH of the solution is dependent on whether the excess ions at equilibrium are due to the strong acid/base or due to a weak acid/base. When a strong acid/base is in excess, the pH calculation is fairly straightforward. Example 1: 35.0 mL of 1.5 M HCN, a weak acid (Ka=6.2 × 10−10) is mixed with 25.0 mL of 2.5 M KOH. Calculate the pH of the final solution. As you can see, it does not take much excess H+ or OH− to drive the pH of a solution to a fairly high or low value. Note that the Ka of the acid did not matter in this case, as the strong acid/base was in excess. Example 2: 25.0 mL of 1.0 M HCl is mixed with 60.0 mL of 0.50 M pyridine (C5H5N), a weak base (Kb=1.5 × 10−9). Determine the pH of the solution. When a weak acid or base is in excess, the pH of the solution does not change as quickly as when a strong acid or base is in excess.